Sodium (symbol Na, from the Latin name natrium) is the chemical element number 11 in the periodic table of elements. It follows that its nucleus includes 11 protons, and 11 electrons orbit around it (according to the simplified model known as "Niels Bohr atom"). Even if a large number of isotopes can be artificially made, all decay in a short time. As a result, all sodium found in nature (mainly in sea water) has the composition 11Na23, meaning that the nucleus includes 12 neutrons. The atomic mass of sodium is 22.9898; if it is rounded, it would be 23. Sodium is a light, silver-coloured metal. Sodium is so soft that it can be easily cut with a knife. When it is cut, the surface will become white over time. This is because it reacts with air to form sodium hydroxide and sodium carbonate. Sodium is a little lighter than water; when it reacts with water it floats. This reaction is very fast. Hydrogen and sodium hydroxide are produced. The hydrogen may ignite. Since sodium melts at a low temperature, it melts when it reacts with water. It has one valence electron which is removed easily, making it highly reactive. Compared with other alkali metals (metals in the first column of the periodic table), sodium is usually less reactive than potassium and more reactive than lithium. These are chemical compounds that contain sodium ions. Sodium only exists in 1 oxidation state: +1. Sodium was discovered by Sir Humphrey Davy, an English scientist, back in 1807. He made it by the electrolysis of sodium hydroxide. It is named after soda, a name for sodium hydroxide or sodium carbonate. It is used in the preparation of organic compounds. It is also used in the street lights that are orange, and ultra violet lights. Sodium compounds are used in soaps, toothpaste, baking and antiacids. . Sodium does not exist as an element in nature; its easily removed valence electron is too reactive. It exists as an ion in chemical compounds. Sodium ions are found in the ocean. 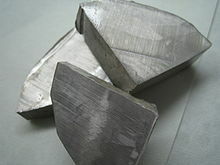 It is also found as sodium chloride in the earth's crust, where it is mined. Sodium is normally made by electrolysis of very hot sodium chloride that was melted. Sodium ion in the form of sodium chloride is needed in the human body, but large amounts of it cause problems, which is why one should not eat too much salt and other food items with huge sodium amount (such as biscuits with baking soda). Many organisms in the ocean depend on the proper concentration of ions in sea water to live. This page was last changed on 21 April 2019, at 07:15.